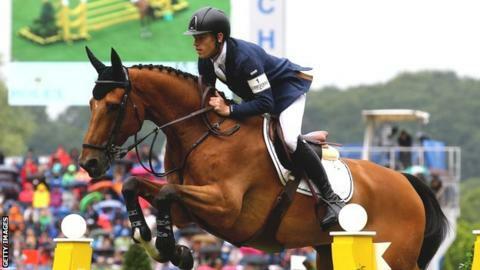 Scott Brash is used to jumping under pressure, and this Sunday he's hoping to enter showjumping's history books. What's more, the event in Canada is not just about achieving a clear round, there's money at stake for the 30-year-old from Peebles - 1m euros, to be precise. "We're going in to Calgary with two wins under our belt so if we win this we'd be the only people in history to be able to do the grand slam," he says. Brash has already won the Geneva and Aachen Grands Prix and the Calgary Grand Prix is the final event as he targets the Rolex Grand Slam. The West Sussex-based rider will compete on Hello Sanctos, the same horse he rode during the London Olympics in 2012 where he won team gold. Since then, Brash's showjumping career has gone from strength to strength. He has been ranked world number one since November 2013 and after his attempt to complete the the sport's grand slam is out of the way, he will have his sights set on the Rio 2016 Olympics. "London 2012 was a massive milestone in my career," he told BBC Scotland's Sport XV. "We targeted the Olympics, left no stone unturned. It was a lifelong ambition, to win gold and in my home country." Despite winning team gold, Brash finished fifth overall in the individual event but hopes to improve on that in Brazil. "We were one fence off from jumping off for a silver or gold medal," he says. "It would be great to try to achieve an individual medal. It's a big aim of mine and I'd love to do it." Before that, it's all about Calgary and a chance to make headlines and history with a third Grand Prix win. Brash describes horse Hello Sanctos as "a bit of a superstar"
"There's a lot of pressure, but it's great to be in the position," said Brash. "To win two is extremely hard. There are not many people to have won two consecutively, I don't think that's ever been done so to win all three would be incredible. "I'm very excited about it. Hopefully we'll do our job right and give it our best. "I cope with pressure well. I love riding under that pressure. I think it brings out the best in you. I think you've got to try and take pressure and show the world what you can do." Brash's father introduced him to showjumping when he was 10 and the pair would travel across the country to compete on ponies before moving on to horses at 16. The horse Brash is most associated with, Hello Sanctos, owned by Lord and Lady Harris and Lord and Lady Kirkham, is as famous as his rider. "He gets a lot of attention, a lot of people come in and see him so he's a bit of a superstar," says Brash. "When I went to try him he was in Germany. We tried him just before the Olympics, with the Olympics in mind. "I thought he was a fantastic horse. He had a lot of qualities and we clicked. As a rider you have to be able to adopt to suit each individual horse but we and Hello Sanctos know each other inside out. "He has made a lot of people's dreams come true and he's made a lot of people proud." And with Rio in mind Brash will be hoping that continues. Scott Brash and Hello Sanctos are on Sport XV: Get Inspired on Wednesday 9 September at 22:00 BST on BBC Two Scotland.